(1) Blowing in the wind ' rep resents a forceful demand for social justice and probably is the best known of all Dylan's songs. In 1964 it became an enormous hit all over the world. 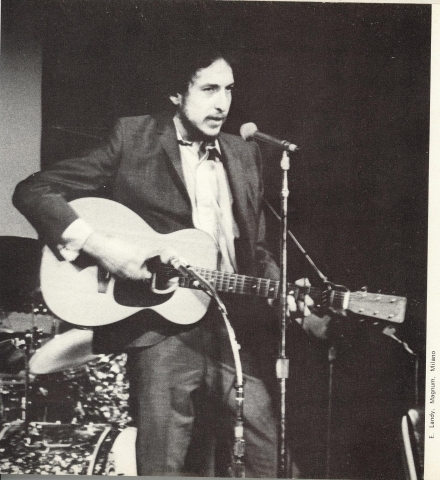 Before Dylan it was not so usual that musicians made comments on politics in their songs. Bob Dylan changed this singing about Vietnam and racial prejudice, and young people came to express their feelings through Dylan's songs. For Dylan words were impor¬tant, and he wrote songs at¬tacking war, discrimination, exploitation, violence between negroes and white people, and even an angry song, `A Hard Rain's Gonna Fall ', about the dangerous quarrel between America and Russia about Cu¬ba in 1962. 'Blowing in the wind ', like most of Dylan's songs, contains political and social ideas, and these ideas are expressed in a simple and direct way, so that they ap¬peal strongly to young people everywhere. And in all the 1960s this was especially true in America where many people, especially the young, were beginning to disagree with the American part in the Vietnam war and wanted to make the world a better place to live in, so Dylan became the symbol of protest by young people against what they considered the wrongs of the establishment.